CAMP HILL, Pa. — There’s an underlying principle guiding Tony Montini and the merchandising and category management teams at Rite Aid Corp.: Be quick to act, but only when you have facts and data to support decisions. In the fast-changing arena of health and convenience retailing, Montini, the drug chain’s executive vice president of merchandising, and his team have shown an ability to determine what will resonate with consumers and a complementary willingness to try new ideas. The result: a steady stream of merchandising innovations that have energized Rite Aid’s business and, in a larger context, illustrate how chain drug stores must evolve to succeed in the long term. For those accomplishments, Chain Drug Review has named Tony Montini as its Merchant of the Year for 2014. “At Rite Aid, we’re all unified around the aspect of being consumer-centric in everything we do,” explains Montini. The veteran retail executive, named to his current post at Rite Aid in 2011 after rejoining the company the year before, has championed speed in decision making, urging his team to act on knowledge gleaned from consumer data and not hesitate to implement new merchandising concepts. “Two areas where we got the team to understand and buy into were, first, the idea that speed wins. We need to move fast and make decisions — but we need to make fact-based, data-driven decisions, not just shoot from the hip. We’ll analyze the data and make a decision, and if the data indicates we were wrong, we’ll course-correct,” Montini says. Besides contributing to Rite Aid’s sales and profit growth, the merchandising group’s agility has enhanced the retailer’s relationship with its suppliers and its reputation in the marketplace, according to Montini. Rite Aid’s “wellness store” format, now accounting for nearly a third of the chain’s approximately 4,600 locations, has been the primary showcase for the retailer’s merchandising innovations. Most recently, Rite Aid premiered new presentations for over-the-counter health products and beauty care — including an in-store beauty adviser — at a number of outlets in key markets. Since the wellness store’s debut in 2011, new concepts have continually been rolled out in such categories as men’s grooming, diabetes care, hair accessories, consumables and grocery, vitamins and supplements, eyewear, nail care, smoking cessation, general merchandise and home health care, among other areas. To that end, Montini can draw from deep experience. He returned to Rite Aid in February 2010 as senior vice president of category management after serving as executive vice president and chief operating officer of national advertising agency Marc USA. 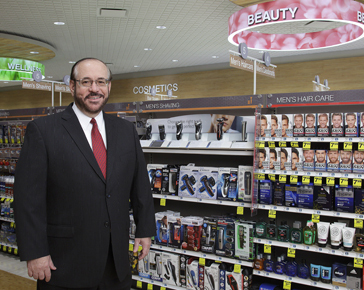 Previously at Rite Aid, he served as senior vice president of category management from 2002 to 2003 and as vice president of purchasing from 1987 to 1989. His retail experience also includes serving as senior vice president and general merchandise manager for the drug store business at Kmart as well as in executive merchandising positions with the former Revco and Reliable drug chains. He also was senior vice president of sales for the vitamin manufacturer Leiner Health Products. Montini emphasizes that teamwork has been a linchpin of the Rite Aid merchandising group’s success.